How Do You Spell LAD? 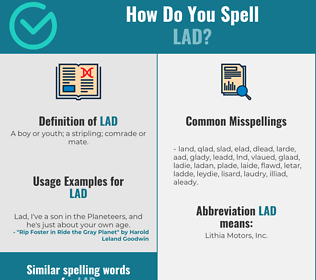 Correct spelling for the English word "lad" is [l_ˈa_d], [lˈad], [lˈad]] (IPA phonetic alphabet). Below is the list of 273 misspellings for the word "lad". A boy or youth; a stripling; comrade or mate. What does lad stand for?